Explore China to see some of the major agricultural developments across this vast country and marvel at the extraordinary feats of engineering and ingenuity that have defined this ancient culture. 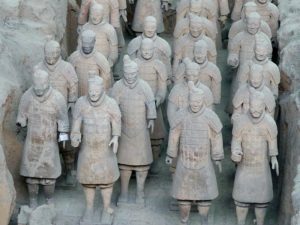 Visit many of the cultural highlights including the Terracotta Warriors and Horses at Xian, The Great Wall of China and, on the extended program, enjoy a luxury Yangtze River Cruise, including Guilin and Hong Kong. This tour is operated by one of our ATOI Travel Partners. Depart North America on overnight flight to Beijing. Arrive Beijing and transfer to a city hotel for a 2-night stay. This evening enjoy a Peking duck dinner. Today's visit will be to the Temple of Heaven or the Summer Palace plus a cattle farm within the city. Lunch consisting of a traditional Hot Pot will be served at the farm. You then have a chance to walk around the feedlot before returning to your hotel. Dinner at a local restaurant. This morning you take a rickshaw tour through the narrow streets and alleys of the oldest part of Beijing, to enjoy lunch with a local family in their home and take a look around their homes and compounds in the Hutong where they live. This is followed with a relaxing cruise on Houhai Lake. This afternoon, visit Tiananmen Square; the Great Hall of the People; and the Forbidden City, which was home to the Emperors for over 500 years. Today visit the Great Wall where the wall is still like when it was first built 600 years ago. A cable car will take you to the highest point for fantastic view of rolling mountains with grass and many orchards. On your return to Beijing you take a Chinese first class Sleeper Express Train to Inner Mongolia. Upon your arrival at Hohhot, transfer to your hotel for breakfast and check-in for a short rest. Then visit the famous Dazhao Temple, which was built in the Ming Dynasty. This region has the biggest production of milk in China and visit the milk processing facility. Return to the hotel for a 2-night stay. Today drive to the beautiful grassland Xilamuren, stopping at a local village to talk with the sheep farmers in the region. You have a typical Mongolian lunch of roast mutton, and a traditional Mongolian folk dance and singing, wrestling and a horse race. Return to hotel. This morning visit a wool and cashmere processing factory, plus a visit the Zhaojun Tomb. This afternoon fly to Xian for a 3-night stay. Xian was the cradle of ancient Chinese civilisation. It is from here that caravans started on the Silk Road to Europe. This morning enjoy a tour to Big Goose Pagoda; the City Wall; and the Museum of the Qin Terracotta Warriors and Horses. This is one of the greatest archaeological discoveries in the world . This evening enjoy the spectacular Tang Dynasty Show with dinner. Today, you will visit the rural County of Shanxi, famous for “Hometown of farmers paintings”. Return to hotel late afternoon. In the morning fly to Xining capital of Qinghai Province, which is situated on the edge of the Tibetan Plateau. On arrival transfer to hotel to check in for a 2-night stay, then visit a Tibetan private company that processes Yak wool. Today you visit Qinghai Baide Food Co. Ltd. one of the largest yak and sheep meat processing companies in Qinghai. Then visit wheat and vegetable farms and talk with growers. Later visit the Tibetan Medical Museum to see the medical achievements made in monasteries. Today drive up to Qinghai Lake, the largest holy lake of Tibet and the largest salt lake in China. Visit local Tibetan nomadic families and then drive to Gonghe where you visit Qinghai Kekexili Food Co, Ltd Gonghe Branch to see its meat processing lines. Then check into hotel for the night. After breakfast drive further to the west for one hour to Horka – wild grassland where you visit one of the company Kekexili’s farms to see how the local yaks and sheep are herded. 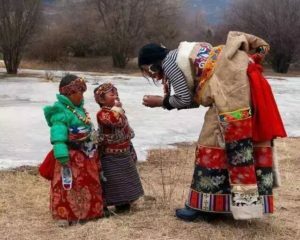 Visit Tibetan farmers, then drive to Gonghe / Chabcha for lunch. Following lunch you drive back to Xining. This morning you visit Kumbum Monastery also called Ta’er Temple which was founded in 1583 in a narrow valley close to the village of Lusar in the historical Tibetan region of Amodo. It is a repository of Tibetan culture and art with various sculptures, statues and religious artifacts. Transfer to the airport for a mid afternoon flight to Shanghai for a 3-night stay. This morning you visit Yangshan Deepwater Port, one of the two Shanghai ports and meet with officials from the Shanghai Pudong container terminal. The amount of commerce flowing through this port will astound you and the 32.5km bridge to get there is called the eighth wonder of the world! This afternoon you visit the Yu Garden, an island of tranquillity amid the hustle and bustle of the city. Covering nearly 5 acres it contains over 30 pavilions and has numerous corridors, small halls, lotus ponds, bridges and winding paths which are characteristics of the architectural style of the Ming Dynasty. It was a private garden with a history of 400 years. Outside the Yu Garden there is a very interesting market, the Yuyuan Bazaar, with everything that you can think of for sale at low prices. This evening you enjoy a Chinese Acrobat Show – an amazing performance of skill and agility. After breakfast, travel to Suzhou, the Silk Capital of the World and a Land of Rice and Fish in China. Suzhou has long been famous for its canals and gardens, and the Grand Canal, which is believed to be the largest internal waterway in the world. It was originally constructed to carry grain from the southern regions to the capital. After lunch, visit a Silk Factory to see how silk is produced from the silkworms and made into the finished articles both in traditional and modern ways. Then a sightseeing tour cruising on the canals to view people’s daily life. Return to Shanghai for your last night on the tour. In the morning fly to Chongqing. 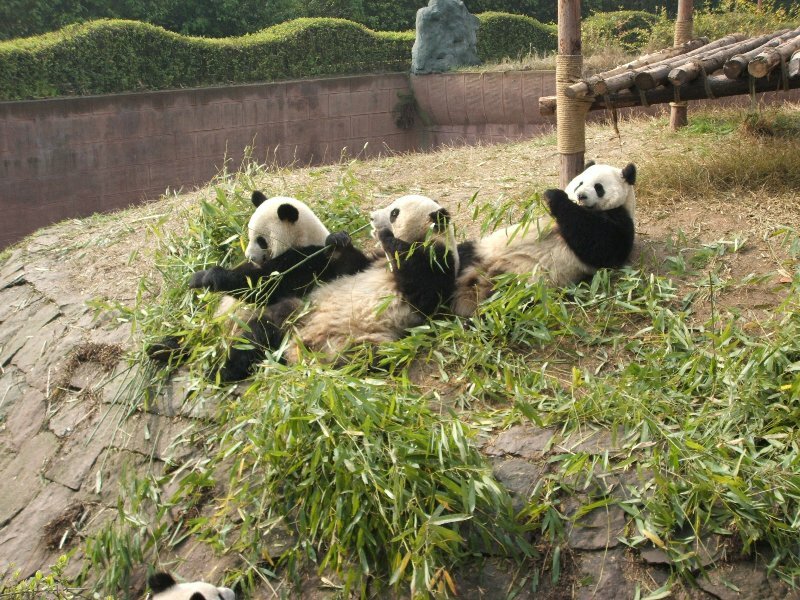 This afternoon you will take a city sightseeing tour in Chongqing to visit the Center Square and the Zoo to see Chinese Pandas. cuisine in a restaurant. You then transfer to your luxury 5-star cruise liner for a three night downstream Yangtze River cruise to Yichang. The Yangtze is the world’s third longest river and passes through three gorges and breath-taking, beautiful mountain scenery. Much of this spectacular scenery is changing as a result of the world’s largest dam project which you will visit as you make your way down stream. The Yangtze, which snakes its way 6,300 kilometres from western China’s Qinghai-Tibet Plateau to the East China Sea, is a very important means of transport and you will see ships carrying all sorts of merchandise. Your first port of call is the remarkable city of Fengdu. Believed, in days gone by, to be the abode of devils. The 700 temples with their bizarre statuary on Mingshan Hill bear testimony to the city’s notoriety as the “City of Ghosts”. This is an optional visit and a fee is charged. You may prefer to stay on board and learn about traditional chinese medicine. You continue down the Yangtze River and stop for a shore excursion to Shibaozhai. Walk through the town and over the ‘drunken bridge’ so named because this suspension bridge also rests on steel cables. Climb the 99 steps of the Red Pagoda. Shibaozhai was relocated to higher ground like many towns on the Yangtze river before the Three Gorges dam was built. This morning you berth at White Emperor City, located on the north bank of the west mouth of the Qutang Gorge. This famous historic site has existed for more than 2,000 years since the Han Dynasty. The shore excursion to the White Emperor City is an optional extra. From here you enter the shortest and narrowest gorge, Qutang Gorge (8km), followed by the second gorge, Wu Gorge, (44 km) with peaks rising high above the river. You berth to transfer to small motor boats for an excursion up the Goddess Stream. Later, in the evening you enter the eastern end of the Xiling Gorge which is the last and longest of the Three Gorges, its 75 km known in the past for swift currents and dangerous shoals. The water level in the Three Gorges can rise a total of 175 metres following the completion of the Three Gorges Dam Project, making navigation much safer and allowing much larger ships to travel. Tonight the ship will pass through the enormous locks of the Three Gorges Dam. After breakfast you board a coach for a visit to one of mankind’s greatest engineering feats to date, the construction site of the Three Gorges Dam Project. The construction formally began in 1994 and the body of the dam was completed in 2003. The final construction was completed in 2008. The dam wall is 2,335 metres long, 185 metres wide at the bottom, tapering up to 18 metres at the top. Enjoy spectacular views of the dam and the 5-stage ship locks. This area offers some of the most magnificent natural scenery in China. You rejoin the cruise and travel further downstream through the lower Xiling Gorge to Yichang. After lunch in Yichang, you will take the bullet train to Wuhan. This morning you will visit the Hubei Provincial Museum followed by the famous Yellow Crane Tower. It is regarded one of the most famous three towers in Southern China. The Tower was firstly built in 223A.D during the Three kingdoms period (220-280). Next you will stroll along the Chu River Han Street. This evening you fly from Wuhan to Guilin. Guilin is a beautiful and unique city nestled amidst paddy fields, and one of China’s important areas for rice and sugar cane production. It is not only famous for its unique landscape, but also known for it’s various agricultural products due to its special Central Asian tropical climate. This morning you visit a factory to meet with a New Zealand entrepreneur and view the facilities where they assemble the equipment to enable them to extract DNA out of any biological material in 5 to 15 minutes. They have perfected their technology for plants, police forensic work, food safety, animals and paternity issues. You will also visit a local organic rice farm and rice processing factory. Drive back to Guilin hotel for shopping or relaxation. This evening an excursion to see how fishermen use cormorants to catch fish. This morning you depart for Mopan Hill Wharf to board a river boat for the 83 km cruise along the Li River,which runs through the heart of this region. On the three hour journey downstream to Yangshuo you see the magnificent Karst mountain scenery. You may see water buffalo and farmers working in the fields. This afternoon you visit a local farmer, view his rice paddy and discuss farming in this area. Later you check into the Yangshuo hotel when there will be time for you to relax and maybe this evening visit the night markets or a spectacular light show (weather permitting - own account). This evening there is a farewell dinner. This morning you will drive back to Guilin to have a tour of the Reed Flute Caves, a spectacular world of stalactites, stone pillars and rock formations with one grotto capable of comfortably holding more than 1,000 people. After lunch, you will take a sightseeing tour of Guilin and then transfer to Guilin airport to check in for our flight to Hong Kong departing late afternoon. Dinner at Leisure. Transfer to the Hong Kong Airport for your flight back to North America.